The members of Prestwick St Nicholas Golf Club originally played on the adjacent 12-hole Prestwick course that held the first twelve Open Championships between 1860 and 1872 (incidentally, there was no Open held in 1871 for anyone who realizes there are 13 years in that time span). The club moved away in 1877 to another piece of land to the south east of Prestwick but fifteen years later, they relocated to the present site where they remain until this day. Henry Cotton, in the 1930s, spoke of St Nicholas as “a miniature championship course” which perfectly describes the links – its only weakness is its comparative shortness. But then that’s probably what endears it to the older, more discerning golfer, who realises length isn’t everything on a golf course! Measuring a little more than 6,000 yards, there are two old-fashioned short par fours on the course, one on the outward nine and one on the inward half. “Maryborough” is the 281-yard 3rd hole, played towards the Firth of Clyde from an elevated tee to a green surrounded by punishing rough. The 276-yard 15th, called “Kingcase” is played to a plateau green that runs at an angle to the fairway. Both holes may look straightforward from the tee but members will tell you a par score at each hole is never an easy feat. Other design traits from a bygone era include a blind approach to the 6th hole, the criss-crossing of fairways at the 6th and 7th holes and the conclusion of the round with a par three hole that plays to every inch of its 227-yard length. The opening three holes and closing three holes are situated amongst the most undulating terrain on the course with fairways rising and falling like huge waves on a stormy sea. If only the holes on the other side of the Maryborough Road between the 4th and the 15th had the same wild contours – not that they are bland by any means. Course management is the name of the game at Prestwick St Nicholas. If you can cope with several blind shots, intelligent bunkering, water (at the flooded quarry on the 8th hole), whins, gorse and rough then a good score can be made here as the fairways are generous and the putting surfaces are famed for their quality all year round. 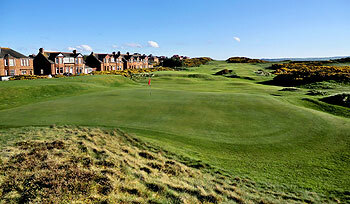 Prestwick St. Nicholas is one of those links courses that you just cannot fail to fall in love with. Even before you reach the car park you catch a glimpse of the course and its humpy-bumpy linksland. As it transpires these are the 17th and 18th holes so you must wait a little bit longer to enjoy these, but it is worth the wait and the journey to get there is just as enjoyable. Holes one to three and 16 to 18 lie on one side of a small road that dissect these from the majority of the course and because these holes are indeed superb, and enjoy the best of the terrain, it’s very easy to say that Prestwick St. Nicholas has a great start and a great finish, and simply leave it at that. Prestwick St. Nicholas will probably never be seen by a number of golfers heading to Ayrshire who are just interested in playing the big names and this can therefore rightly be called a hidden gem. Holes two, three, 15, 16 and 18 are of exceptional quality and although there are a few ‘filler’ holes out on the flatter part of the course this is a true links that I whole heartedly suggest you play. Don’t be fooled by the par of 69 and a yardage of just 6,044 as it plays every bit of its length and requires plenty of creative shot-making. What better way to spend a sunny Bank Holiday Monday than out on the links enjoying a 4-ball with three of your golfing mates? I just love this wee course – and PSN really was a wee course for some reason today, with the regular markers played from forward tee positions on many of the holes, reducing the overall length to well under the 6,044 yards indicated on the scorecard. The firm and fast playing conditions meant every green could be reached in regulation, apart from maybe the long par four 7th and 13th, which are tough enough to get on in two at the best of times. The greens, as ever, were in great condition so my only gripe was with the aesthetics of having fairways cut in a striped pattern – surely that’s a parkland characteristic and not one to be used on a links, where “half and half” mowing lines are the accepted norm? The opening and closing holes are still the best on the course, though the short, doglegged par fours at the 6th and 15th are also a couple of very fine holes. Regarding the long par three finishing hole, I wonder how many cars get damaged in the car park from sliced tee shots as golf balls twice clattered into the side of the clubhouse after we finishing our round. In these days of Health & Safety, I’m surprised there’s no protective netting in place because there’s a real danger of being hit by a stray tee shot. Bear that in mind when you next play here – it's maybe best to park in the street outside and keep your wits about you as you walk through the car park to the pro shop! Although it measures just 6044 yards, there are some tight drives through gorse and there is almost always the wind to take into contention. The first three and last three holes are on the clubhouse side of Marlborough Road and feature some very undulating fairways. You will be acutely aware of out of bounds on many holes. A big slice on the par four 1st will see you over the fence and heading for the sea. Behind the 1st green are the ‘Salt Pan’ buildings which were constructed in approximately 1790 and were used to extract salt after boiling the sea water. The land is somewhat different on the other side of the road. The 7th and 8th holes play around a lake that was once a quarry. The 7th is a good hole – a long par four and rated index 1. The tee is right beside the adjacent beach and is very exposed to the elements. Accuracy is needed for the second shot on the 8th as your line is over the edge of the water. The back nine opens with a par three, a par five and then another par three. The 11th has out of bounds along the right but if you play safe down the left then you need to avoid four bunkers. Holes 13 to 15 are probably the least interesting part of the links. However, the last three are intriguing. Sixteen and seventeen have gorse and then out of bounds along the right and the 18th, a long par three of 227 yards, has out of bounds by way of the car park on the right. I really enjoyed my round here. I knew I would after such a warm welcome from the starter and looking at the parcel of holes near the clubhouse which are great little links holes. Personally I preferred this course to Barassie and it is on a par with Troon Portland (ranking 9 and 10 in Aryshire IMHO). Too short for the pros but a great tactical test of links golf with risk and reward features e.g. which club to play from the beautiful 16th tee. The club offers a warm welcome and a good test of golf as well as being good value for money. The traditional links design can be considered a little flat, both in elevation and inspiration for the holes located far from the clubhouse. These holes though should offer some respite in the event of high winds with greater margin for error. Holes 6-9 are of good better quality. The reservoir on the 8th is not the norm for a links course but makes a nice addition to the challenge, even though it should be out of play. The course’s crowing glories are the standout holes near the clubhouse: 1-3 and 16-18. The bright yellow gorse bushes add beauty, definition and challenge, especially the clump in the middle of the 16th which mandate a clear choice being made on the tee – left, right, short, or carry – making it a great golf hole. The 18th is an absolute nerve-jangler of a long par 3. Out-of-bounds right for the entire length of the hole plus the closeness of so many windscreens in the car park make a closing par feel like a birdie. This is a much much better track than your rating suggests.Easily as good as Bogside, probably better. Very surprised at it ranking so lowly when you have courses like the Kintyre and Letham Grange ahead of it. I stand by my rating. Four balls is a good rating in itself. If I were to grade Prestwick St Nicholas on friendliness and value-for-money it would score even higher. There are some great holes, but the course itself, and as a whole, is not a 5 baller to my mind. The rating system on this excellent website is not meant to be highly scientific and is all the more charming because of that. If I had rated Prestwick St Nicholas higher, I would have done overseas visitors a disservice. Furthermore, I’m not sure how many more balls I would need to adequately grade personal favourites such as Turnberry, North Berwick, Cruden Bay and Brora. For the record though, I have only played one third of Scotland’s top100. In support of the original review, I have to say that I think the PSN is 4.5 stars - really enjoyed it, the parcel of holes by the club house are as much fun as you will find anywhere, but some of the holes on the other side of the road, good though they are, let the atmosphere down slightly. To date this is one of the most underated golf couse I have played in Scotland. Despite the harsh November conditions nothing could take the smile from my face as I drove the 40-mil journey home. Pound for pound this course holds its own with its many nearby alleged superiours. £25 winter fees offer a bargain that cannot be missed. The excellent condition of the greens cannot be exagerated. The welcome offerd by the highly experienced starter sets the trend for a most enjoyable alround experience. I played this gem of a course for the first time on May 1st, 2008. The condition of the greens was perfect and they ran true. The fairways were undulating and presented strategic challenges. I thought the holes were varied and interesting, and the views of the surrounding Ayrshire coast on a sunny evening were stunning! My favourite hole was the 16th 'Tom Morris'. A twisting, undulating hole of great character. Well worth playing this course as it is true links standard and a real gem! Our fourball played St.Nicholas on a rare February morning (dry and sunny with just a light breeze blowing) so conditions were ideal for a wee winter warmer on the Ayrshire coast. I last played here a couple of years ago and this visit reaffirmed what I’d thought before (and what my three mates thought this time) – St.Nicholas is a cracking wee links course that is much under rated. The starter mentioned the two stone buildings beside the green at the 3rd hole were old Salt Pan Houses dating back to 1760 – I’m surprised the club make no mention of such a fascinating fact in their very succinct web site pages. An oversight that should surely be corrected. Some winter tee positions were a little strange. Like the 2nd hole, where the tee was placed 150 yards away (almost at right angles to its normal elevated position). Or the 7th hole, when the hole was totally devalued by placing the tee 150 yards ahead of its normal place (perched on a sand dune on the right of the fairway). The opening and closing three holes are laid out over great links land and they remain etched in the mind as an abiding memory of playing here so I’d forgotten how good so many of the holes between 4 and 15 really were.But what have the club done with the par three 10th hole? An artificial mound has been created to the left and the back of the green, affording the green some protection from sea spray that comes off the coast nearby but I think it is an abomination – and had the cheek as a visiting guest to tell the club secretary because, like football, golf is also a game about opinions! The clubhouse locker rooms are so well appointed and the lounge so informal and relaxed – Prestwick St.Nicholas members should be really proud of their club and the way they welcome visitors so warmly. Incidentally, playing here was a real bargain – not only do they offer a cut price winter rate green fee but they also allow a 25% Openfairways card discount per golfer on top! Prestwick St Nicholas is totally overshadowed by its esteemed ancient neighbour but it many ways and certainly pound for pound, St Nicholas is every bit as good. The character of the course is distinctly different and the best holes for me appear at the start and the finish…… these undulate through wild links terrain while the mid section is flatter and less interesting. Nevertheless it’s a stunning little track and one that I play regularly when visiting Ayrshire and I recommend that you play it and I promise you will be pleasantly and pleasurably surprised. As so often happens with courses very near more illustrious neighbours (Murcar and Royal Aberdeen, Portstewart and Royal Portrush to mention but two other cases) Prestwick St Nicholas gets overshadowed by old Prestwick which is a real pity. The course has a particularly good opening and closing stretch of half a dozen holes played over some formidable linksland. The course is not overly long at a touch under 6,000 yards from the medal tees and the rough is not too penal though beware if the wind blows. Greens are like putting on a green velvet carpet, even at the end of a long, hard season. The clubhouse has been modernised to a high standard a warm welcome awaits from members that have been met on recent visits. This is a gem of a Scottish links that you'll love and I’m returning to play here in the club’s Gents Seniors Open in June, so I’ll report on my latest St Nicholas experience later this year.